Revolver Mousetrap From 1882 Probably A Smarter Idea At The Time. We have seen mouse comes out to the trap that you strategically placed in the corner where it was forced to walk. It takes a minute to breathe in the fresh aroma from the cheese you placed ever so gently on the trigger switch. Then, it makes its move. All your attempts kiss in the dust. 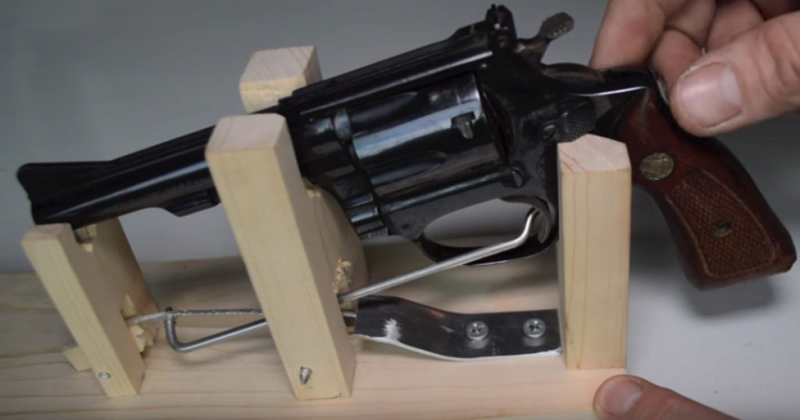 But will what happen when this revolver mousetrap will be set. You can easily guess it. James A. Williams of Fredonia, Texas, wanted to make a new kind of trap "by which animals which burrow in the ground can be destroyed." He took inspiration from 19th Century "burglar-alarms" that involved jury-rigging a pistol and lever contraption "so as to kill any person or thing opening the door or window to which it is attached." Here you can see the patent for the overkill trap. A YouTube channel called Shawn Woods has recreated this trap. The channel is dedicated to archery and survival but they also have video series called Mouse Trap where they show how to make different DIY mouse traps. This is not cheap but it can be made who have revolver at their home. Williams points out that his trap design, which involved a "revolver or pistol" secured to a "suitable frame," has the advantage of sounding an alarm when it goes off so that it can be reset. But the invention never took off- perhaps because people had reservations about keeping a spring-loaded revolver under their kitchen counter.